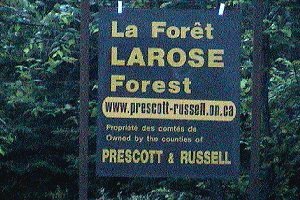 The Larose Forest is a largely contiguous forested area of over 10,000 hectares (26,000 acres), making it particularly significant in the Eastern Ontario region. It is criss-crossed with dirt roads and trails (160 km) that penetrate a good variety of forested habitats and wetlands. The area abounds in wildlife, particularily noted for its thriving moose population. This is also one of the last strongholds of the Whip-poor-will in Eastern Ontario. Forest maintainence has fallen on hard times since responsibility was handed to the municipality some years ago. The Counties of Prescott - Russell are unable to keep the trails and roads up to the standards of ten years ago. Beavers, whose numbers are burgeoning, are causing flooding in many trail / road areas. For a superlative treatment of the Larose Forest, including possible concerns over loss of parts of this magnificent natural area, see Christine Hanrahan's article in Volume 38, Number 1 (the Jan. - Mar. 2004 issue) of the OFNC's quarterly, Trail and Landscape. The Ottawa Field-Naturalists' Club (OFNC) has on their website information on the Larose Forest, an Update on its Status and a list of the Birds of Larose Forest. Just outside the actual forest area are a number of important sites that are also included in this loop tour. The High Falls Conservation Area and Casselman Sewage Lagoons near Casselman are two of these included in this loop. The spring flooding areas near Bourget and Riceville are treated in the Spring Flooding Loop. 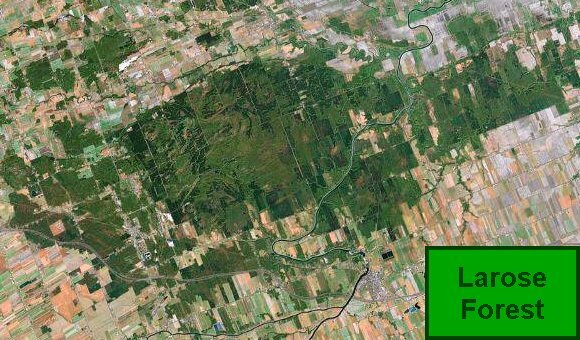 Please note that if you are coming from Ottawa and wish to get into the forest area by the quickest route, you should take Exit 88 north from Highway 417, turning almost immediately right onto Russland Road after crossing the 417. After 7 km Russland comes out on Limoges Road, where all you have to to is continue straight ENE into the forest in about 2 km. 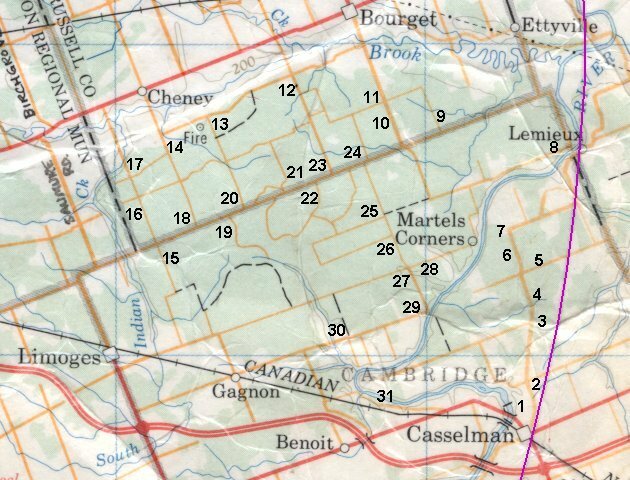 For other reasons, the loop route itself begins and ends at Casselman.